Her work, according to the obituary, is now part of the American Bar Association’s guidelines for death penalty defense lawyers. I’ve never been a criminal defense attorney, but as a civil rights lawyer I was moved by the story of Holdman’s advocacy and commitment. But as someone who has devoted her career to collaborative problem solving and building relationships with would-be adversaries, one line of Holdman’s obituary jumped out at me. Many mitigation specialists who followed in her footsteps are journalists and social workers. ‘It’s the antithesis of being a lawyer; it’s all about human feeling and connection,’ Mr. Lohman said. Is that true? Is human feeling and connection the “antithesis” — the opposite — of being a lawyer? I don’t think so. And neither does J. Kim Wright or the hundreds of lawyers mentioned in her compelling book, Lawyers as Changemakers: The Global Integrative Law Movement. How Does Structured Negotiation Fit In? Integrative law is a context for law, more of a lens than a practice area. .. Integrative Law [has] to do with seeing the legal system as an interconnected system of human beings. Integrative Law is a new wave of legal practices…to serve the same needs and purposes as the conventional legal system, but to do so in a way that is far more likely to generate productive outcomes, heal broken relationships .. . turning conflict into an opportunity to co-create a better world for all. In other words, Integrative Law is, in fact, about human feeling and connection. Wright’s book is partly an edited collection of writings by integrative lawyers across the globe, and partly Wright’s account of yet other lawyers welcomed in her big tent. Who can you find in the book’s 400 plus pages? Texas contract lawyer and big thinker Linda Alvarez who has developed a way to negotiate contracts that recognizes true interests and relationships, and who has authored her own integrative law book titled Discovering Agreement. Catholic nun and lawyer Sister Simone Campbell, founder of Network, Advocates for Justice Inspired by Catholic Sisters. Hundreds of other lawyers are featured or mentioned the book – practicing all types of law from environmental to business to criminal defense. They just might change the way you think about lawyers; the way the profession thinks about itself. And for sure they will shine a light on different strategies and approaches for the next generation of legal practitioners. Wright graciously included Structured Negotiation in her round-up of integrative lawyering around the globe. I’m glad she did. Structured Negotiation is a collaborative, problem-solving approach to law that has been used for two decades to improve access to information and technology for the blind community. It is a method with discreet elements that can be replicated in other fields of law. As I write in my book, Structured Negotiation, A Winning Alternative to Lawsuits, practicing law without lawsuits has taught me that lawyers can be advocates and peacemakers. That being friendly can go hand in hand with strong client representation. That relationships matter, a core tenet woven throughout the wide variety of integrative lawyers captured in Wright’s book. Structured Negotiation is not the only outstretched hand in the legal profession. Many forms of collaboration are taking root as clients and lawyers demand less adversarial ways to resolve claims. …Together these initiatives are referred to as integrative law, a broad tent that welcomes new visions of what the law can be. I hope people will read Lawyers as Changemakers. And I hope that one day, “human feeling and connection” will be a term that jumps to mind when thinking about lawyers both in the United States and around the world. 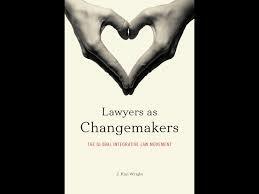 This post is about a book called Lawyers as Changemakers: The Global Integrative Law Movement. It is by J. Kim Wright. She has travelled the world meeting lawyers trying the change how people practice law. The book is about lawyers who work on criminal justice issues, environmental causes, contracts and many other things. The book talks about Structured Negotiation. This is the cooperative problem solving strategy that Lainey Feingold has used for more than twenty years. The method has helped make technology and information more usable by blind people. Back to top of this post.